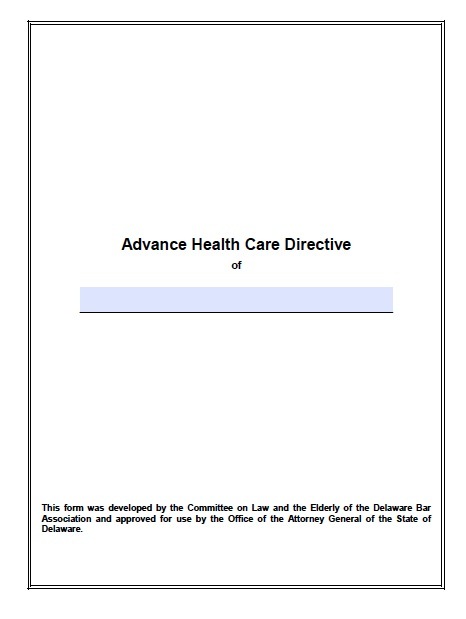 Delaware medical power of attorney, also referred to as an “advanced healthcare directive“, enables you to establish the type of health care treatment you want in the future if you are unable to specify it yourself. This important tool can prevent your family from going through much turmoil if you become incapacitated and terminally ill. If you suffer from an irreversible condition that leaves you unconscious and near death, without the directive a surrogate will be named to decide your treatment. This most often will be your spouse, adult child, or adult sibling. Of course, the surrogate might not know what treatment you would want if you had no chance of recovery or regaining consciousness. In Delaware, the agent you designate as your health care representative will be able to make any health care decision for you, if you are found to be incapable of making them, for example, because of advanced dementia. This does not include decisions about whether to withhold or continue life-sustaining treatment, such as mechanical respiration or artificial nourishment. Surrogates may only elect to withhold or continue this type of treatment if the principal experiences a condition like an advanced neurodegenerative disease that leaves the principal permanently unconscious and near death. The principal may specify in the directive that she would prefer not to continue life-sustaining treatment in that condition, or that she would prefer to continue receiving the treatment. Use the guide – How to write the document.